Disclaimer: this post does not include a homemade pizza crust recipe. 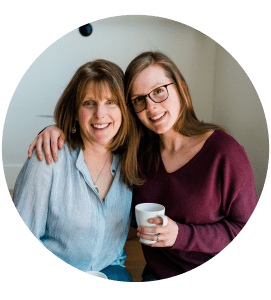 We’ve been working on a gluten free + vegan homemade pizza crust recipe for a while, but it’s not quite there. It’s a pretty daunting task! Rest assured, we’re still working on it and we’ll be sure to share it as soon as it’s ready. 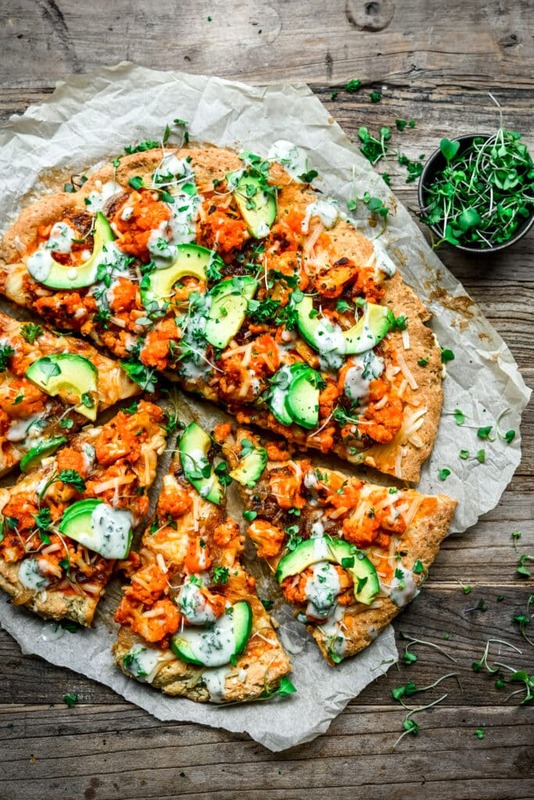 Luckily, there are some great gluten free pizza mixes out there. This one by Bob’s Red Mill is our current favorite. They include instructions on making it vegan by using flax eggs instead of regular eggs. The crust turns out a bit more dense and thick than I usually prefer (definitely a thin crust kinda gal! ), but it still tastes great and holds up well. 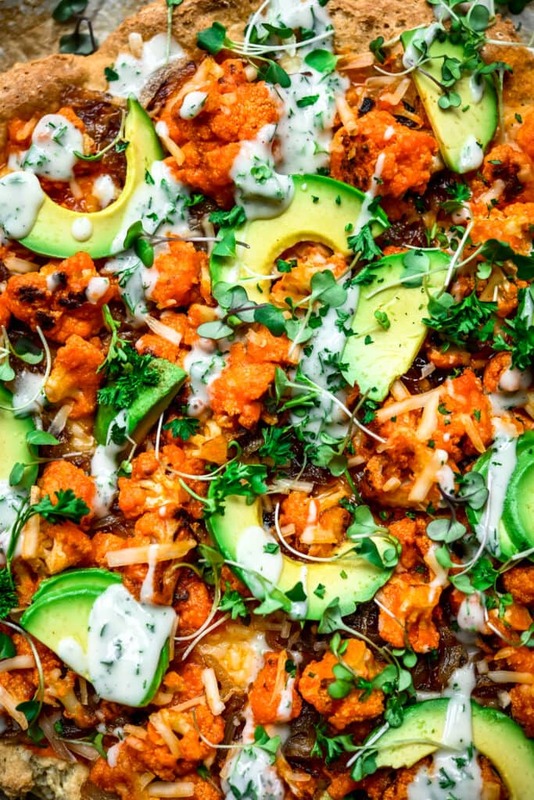 I’m going to go ahead and say that buffalo cauliflower is one of the greatest vegan inventions out there. 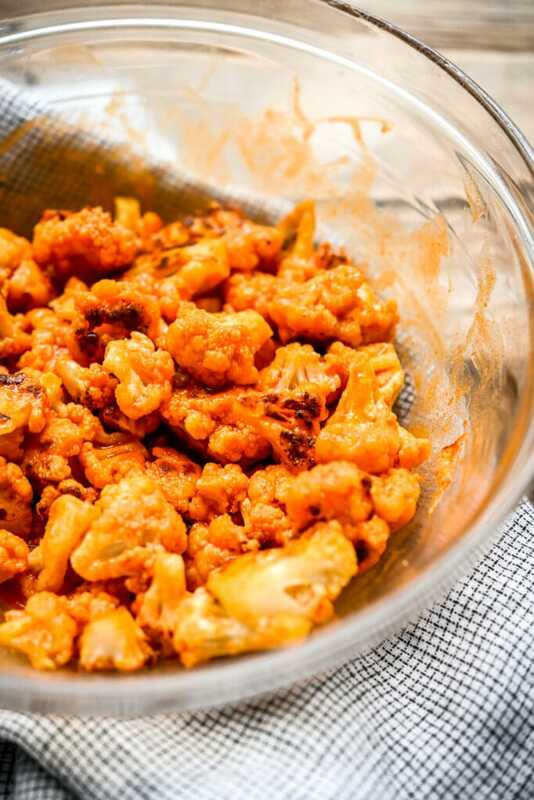 It’s spicy, flavorful, satisfying, and surprisingly healthy (it is cauliflower, after all!). Instead of frying the cauliflower, we bake ours, which happens to be much easier. Essentially, all you have to do is roast the cauliflower and toss it in the sauce. 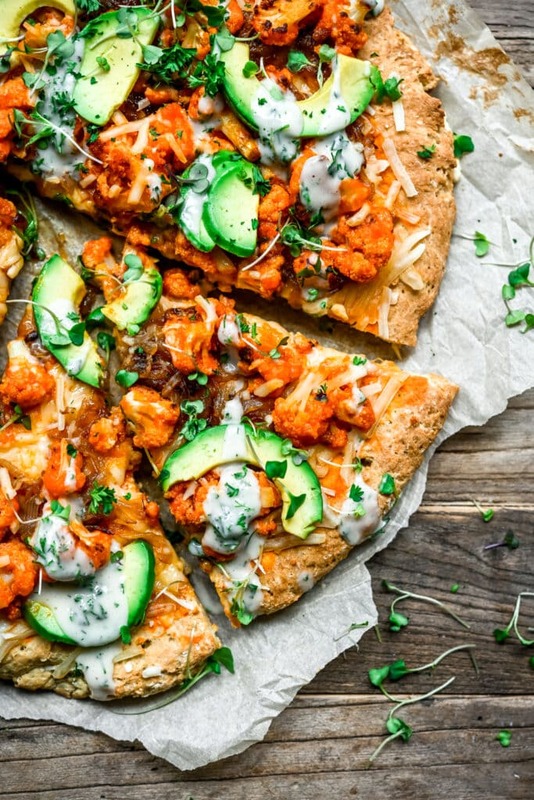 While you can certainly eat the buffalo cauliflower on its own, we highly suggest trying it on this pizza. 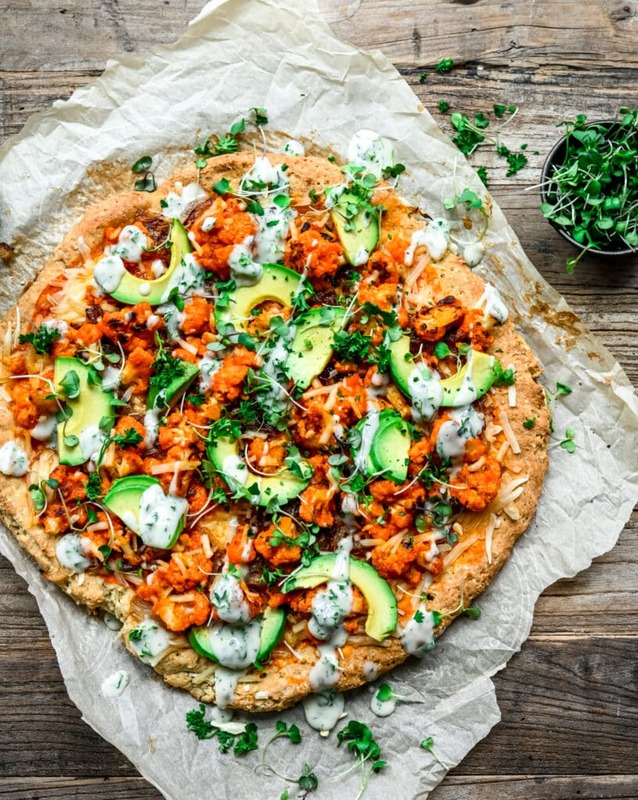 Friday is typically pizza + movie night in our house, and this vegan buffalo cauliflower pizza really hits the spot after a long week. What better way to wind down? Tonight, we’ll be watching Harry Potter (for the millionth time). Anyone else a huge Harry Potter fan? I’ve always been obsessed, but my husband never read the books growing up. When we got engaged, I told him he’d have to read the whole series before we got married. (Kidding, but also not kidding.) Any true Harry Potter fan knows that the books are 10x better/more magical than the movies. He read all seven books before we got married last September and now he’s just as obsessed as I am (yay!). At least once a year, we watch the entire series from start to finish. We just started the first movie last night, so we’ll probably be spending a good part of the weekend on the couch (hopefully eating pizza leftovers)! 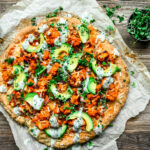 Looking for more vegan comfort food recipes? Try these Loaded Spicy Black Bean Vegan Nachos (perfect for a large crowd! ), this addictive Vegan Spinach Artichoke Dip, or these Cheesy Vegan Hasselback Potatoes. 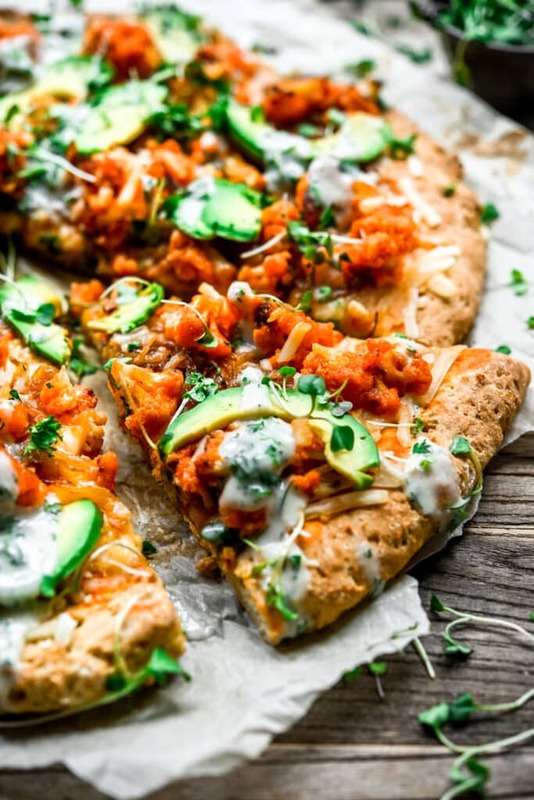 You can also follow our Vegan Comfort Food board on Pinterest for more ideas!